Start by building the Barracks building in all your characters’ garrisons. You will need level 3 to increase your follower limit to 25 followers (we want as many as possible). The most important building! With the level 3 Inn, you unlock Treasure Hunter missions, which adds several more missions to your roster that can reward you with plenty of gold. The most lucrative is Blingtron’s Secret Vault, which awards you with 1000 gold, but there are several more missions besides that. In addition, the Inn allows you to recruit one new follower every week. This is crucial, because you need to recruit followers with the Treasure Hunter trait, every week, until all your followers are bona fide treasure hunters. The trait doubles your gold reward on each mission per character – a.k.a. Blintron’s vault could potentially reward you with 4000 gold! You can speed up the recruitment process by rerolling the traits on your already recruited followers as well. Got to get those weapon and armor upgrades for your followers! You can keep this building until all your followers are at least 660+ ilvl, and you have a lot of backup upgrades for the new followers you recruit every week. I don’t care if he’s annoying to acquire on all your alts – you need him! 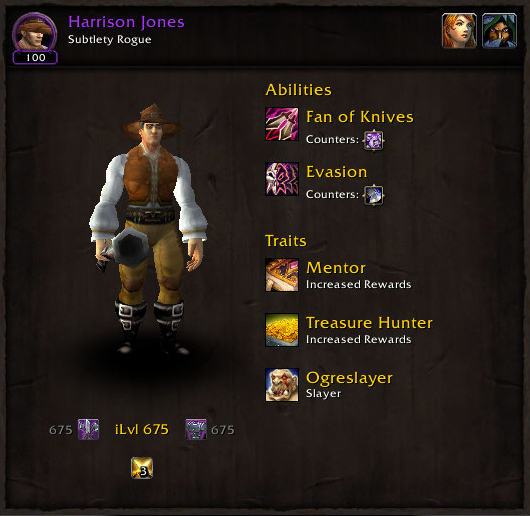 Harrison Jones is a follower you obtain by completing the Master Relic Hunter achievement. Not only is he a Treasure Hunter, he also has the Mentor trait! The Mentor trait will buff all his companions on missions to at least the same level, and item level, as him. A.k.a. if you have him at level 100 with 675 item level, all followers that tag along on the same mission as him will have the same level and item level. You can basically level followers from level 90 to level 100 within a day. Not to mention, you have a much higher success chance on high item level missions, if you aren’t fully upgraded. Once you have recruited 25 Treasure Hunter followers, all preferably with 675 item level, it is just a manner of logging in every day on those alts and do garrison missions. You will get about 1000-2000 gold per character, per day. I have 14 level 100 alts I can do this with, but I basically only visit 5 characters on my main realm every day (got to keep it at a sane level). It is a bit of a morning ritual to do garrison missions; coffee helps. It takes time, but gold is much more guaranteed this way than on the Auction House. Upgrading all those Garrisons buildings on your alts can be a bit costly as well, so you need a few thousand gold to start with. But remember, if you keep at it, you will start earning a lot of money on those alts! Tips! Want to speed up the process of completing and sending out followers on missions? Download the Master Plan addon for a better Garrison UI! Your morning ritual will be done in a few minutes. There are a few more things you can do with the Garrison to earn money, if you are feeling diligent enough. It will take even more effort though. You ready? A lot of the gold missions are locked to the tier 3 shipyard, so you want to make sure that it is fully upgraded. Since the Oil from garrison missions is kind of scant, even with followers that have the Greasemonkey trait, you will need to acquire the Oil Rig to have a steady income of Oil (unless you do Tanaan dailies every day). The Oil Rig unlocks a misson, Oil Rig: Pickup Location, that has 100% success chance and awards 400 Oil. You can get the blueprint to the Oil Rig in Tanaan by being revered with The Hand of the Prophet (A) or Vol’jin’s Headhunters (H). You can get the blueprint for the Spyglass from rares in Tanaan. If any of your ships have the Ghostly Spyglass ability, you start unlocking the Ghost missions. These are rare missions, and not only do they award gold, but also the new heirloom rings. You want to have a few ships with this ability. If you have the trading post, you can buy materials for any leftover garrison resources you have. Sell it on the auction house whenever you feel like it – or keep it for your own professions! If you have Salvage Yard level 3, your garrison missions will start awarding you with Big Crates of Salvage, which contains random green and blue gear pieces. Keep the ones you want for transmog and vendor trash the rest! Awards more gold than you’d think. Well, now you know my secrets. I hope you found this mini-guide useful, and hopefully you’ll also get rich in time for Legion. Got to have something to do until then! Good luck my fellow pirates! You get booty, and you get booty – everybody gets booty! Good guide, been doing that since the very start of Warlords with similar results! Would just add one thing: the “AH game” gets substantially improved by doing missions regularly as they award pets / special items and resources that can easily be converted to sellable materials. I’m gonna test this guide! Hopefully I’ll be a millionaire too! On my main (who is also a MW Monk, can You believe? :p) I got all the followers on purple 100lvl with 675ilvl and also a lvl3 Inn, but I don’t getting those fancy 1k gold mission :/ Last time i got I around 1,5 month past… Any ideas why? 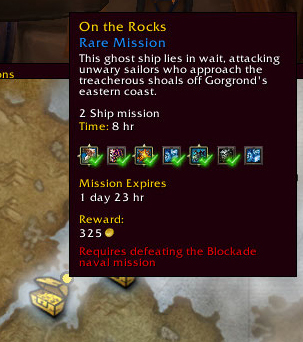 The gold missions seems to have become rarer, which is why this method is best used when you can do it on a lot of alts (I got 14 alts and get about 16k gold everyday, but I have shipyards on them all). The Shipyards are still going strong, gold-wise, but it’s a lot of work. Oh and try doing the Harrison Jones quest, they’re sooo much easier with flying now! ^^ Good luck! Previous Previous post: Legion Dungeon Race!